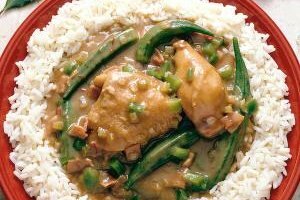 Plenty of chicken dishes can be cooked in a slow cooker. 1 How Do You Tuck the Wings to Roast a Chicken? Your slow cooker saves you tons of time by gently cooking your meals over the course of a few hours while you get other stuff done. But to get the most out of your slow cooker, you need to know what to put into it to get delicious meals. Chicken cooks well in a slow cooker, and there are plenty of recipe variations that let you add variety to your family dinners without adding too many complicated steps before the ingredients go into the cooker. When you're crunched for time, three-ingredient chicken dinners are a way to get your slow cooker started before you head out the door in the morning. The simplest version involves mixing chicken breasts, a can of garbanzo beans and a jar of spaghetti sauce. You can switch the garbanzo beans with red beans, corn or green peas and replace the spaghetti sauce with Alfredo sauce, teriyaki sauce or a can of creamed chicken soup to create completely different tastes. Using chicken legs or a mixture of different pieces can also add variety. Add some ranch-flavored seasoning mix or dry soup mix to transform your simple meal into a zesty treat. You can serve your meal as-is or ladle it over rice or pasta for a heartier dish. Your slow cooker is great for preparing chicken-based meals that you might otherwise prepare using different methods. Cook skinless, boneless chicken breasts in the slow cooker with salsa and then shred them and pile into folded soft tortillas with lettuce and grated cheese for instant chicken tacos. Top the tacos with guacamole, diced tomatoes and creamy dressing. Chicken thighs cooked with barbecue sauce, chili powder, onion and paprika become tender enough in a slow cooker to make pulled chicken sandwiches when you place the meat on hamburger buns. By far the most economical way to cook chicken in your slow cooker is to use the whole chicken. You don't need to cut it up but simply lay the chicken in the slow cooker over a bed of chopped carrots, celery and onions and pour in some chicken broth. For additional flavor, season the chicken with a combination of butter and ranch seasoning mix. Apply the seasoning under the chicken's skin so the meat absorbs the flavor. 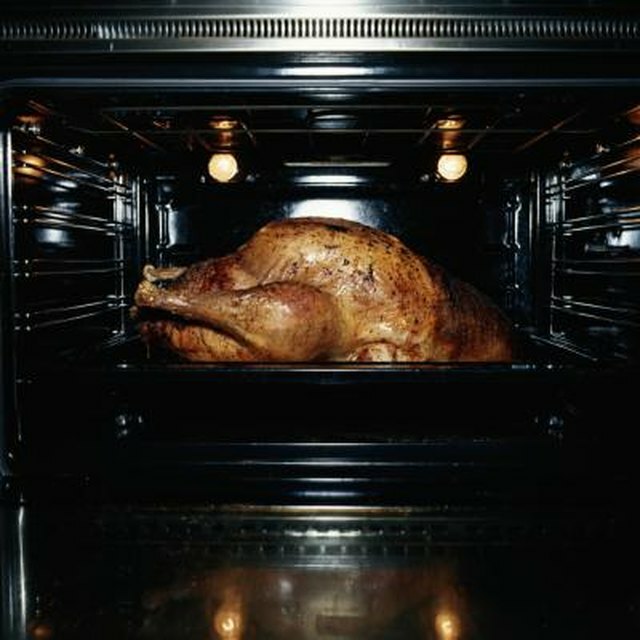 After eight to 10 hours on the lowest setting, you'll have a perfectly cooked chicken dinner. Even better, you'll have plenty of leftovers to make meals with later in the week. In general, legs and thighs stay juicier in a slow cooker, but white meat cooks fine in a slow cooker as well. You might want to leave the skin on your chicken while cooking to keep it moist and remove it after cooking to reduce the total fat level of your dish. If you have a little extra time, you can brown your chicken pieces before tossing them in the slow cooker to give them a richer flavor.